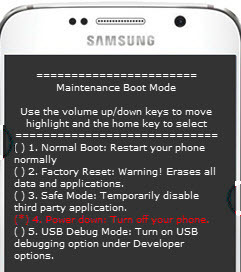 Press and hold the Power and Volume Down buttons until the Maintenance Boot Mode screen appears (approx. 12 seconds). From the Maintenance Boot Mode screen, select Power down. Utilize the volume buttons to cycle through the available options and the Home button (located below the display) to select.